I'm delighted to join you today for the inaugural HKEX Biotech Summit. I must say it's a pleasure to be speaking to you here at the HKEX Connect Hall. Barely a month old, Connect Hall rises from the site of our historic Stock Exchange Trading Hall. While it celebrates the past, with a museum dedicated to Hong Kong's stock market history, Connect Hall, just like HKEX and today's summit, focuses confidently on the future. Major economies around the world, including Hong Kong, to be sure, are embracing innovation and technology as the engine for future growth. We are determined to promote the development of innovation and technology to diversify our economy, to give fresh impetus to other industries, to create wealth as well as more opportunities for our young people. We are investing our resources and efforts to target four areas where Hong Kong has strengths and potential, namely biotech, artificial intelligence, smart city and Fintech. We certainly have one of the prime prerequisites for playing a hub role in biotech. And that's our globally prominent financial market. One of the world's leading financial capitals, and China's major international financial centre, Hong Kong is indisputably well suited to meet the varying financial needs of biotech companies, whatever their size and whatever their stage of development. Our stock market capitalisation rings in at more than US$4 trillion. And in terms of funds raised through IPOs (initial public offerings), the Stock Exchange has topped the world in five of the past nine years. Last year, we raised about US$16.5 billion. When it comes to biotech companies, the sector faces singular revenue and cash-flow challenges due to the long and costly journey inherent in turning biotech research into effective products and applications. We are keenly aware that biotech companies with promising developments in the works require substantial revenue to get through the arduous, but necessary, approval process demanded by relevant authorities. With biotech and other sectors of the new economy in mind, we have reviewed our listing regime looking for ways to develop broader fundraising capabilities. Following the general principles laid down by our Financial Leaders Forum, the Stock Exchange launched a consultation, in February, on establishing a new listing regime for emerging- and innovative-sector companies, with a view to boosting Hong Kong's competitiveness as a listing platform. With regard to biotech, we propose - subject to appropriate safeguards - to allow the listing of biotech companies that don't meet the financial eligibility requirements of the Stock Exchange's Main Board. Let me add that the Financial Leaders Forum set up in August last year, chaired by myself, is made up of prominent members from the financial services sector as well as top leaders of our financial regulators. One of the key objectives of the Forum is to examine strategic proposals that will further enhance Hong Kong's position as an international financial centre. It reflects the Government's determination to play the proactive role as a facilitator and a promoter and to pursue promising new opportunities in a forward-looking manner, and to support industries in which Hong Kong enjoys advantages and potential. We will also regularly review regulatory requirements to ensure that Hong Kong retains an attractive, open and business-friendly environment. While financing is essential to the success of biotechnology, money alone won't ensure success. Equally important is the availability of talent of the right calibre, as well as a supportive, responsive and innovative culture. In that regard, the fundamentals for a flourishing biotech industry are well in place. And in my recent Budget, I am setting aside additional resources to the order of over HK$50 billion to strengthen our work in these areas. The Hong Kong Science Park, our flagship technology centre, will be provided additional resources to enhance its research-focused infrastructure and the support to its dynamic international and local tech tenants. The Innovation and Technology Fund will also receive additional injection to continue its critical support to applied research and development. Another key initiative I would like to highlight is the establishment of two research clusters - one for healthcare technology, the other for artificial intelligence and robotic technologies. The objective is to attract more renowned international research institutions and technology companies to come to Hong Kong and to bring in more experts from around the world, thereby helping us nurture our home-grown talent. I'm confident, let me add, because of our encouraging track record in this regard. For example, in late 2016, the celebrated Karolinska Institutet of Sweden opened its first overseas research facility for reparative medicine at Science Park. In September last year, the Massachusetts Institute of Technology (MIT) opened its first overseas Innovation Node here, providing entrepreneurial education and training for students and researchers from MIT and also from Hong Kong. We will also launch a Technology Talent Scheme later this year, which will include the creation of a Postdoctoral Hub programme, designed to help recruit post-doctoral talent for our research institutions. The scheme will also fund companies on a matching basis to train their employees in high-end technology. 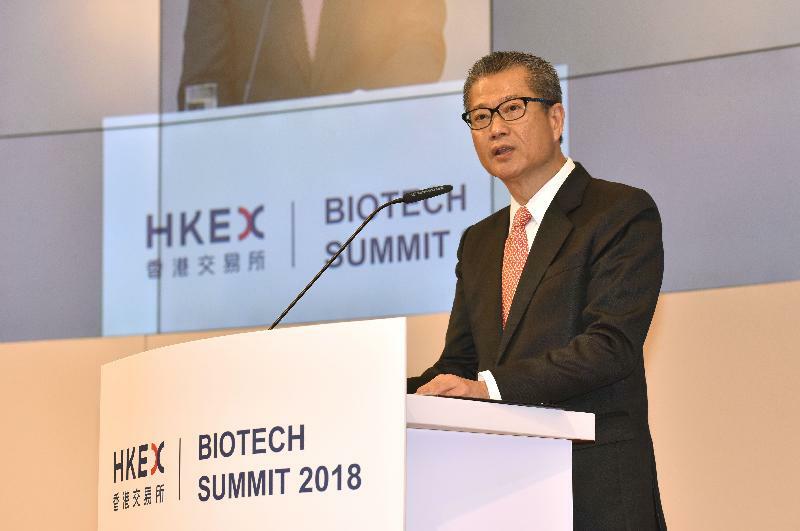 Ladies and gentlemen, the message is clear: we are determined to make Hong Kong among the world's most desirable destinations for biotech companies. Today's summit is an important step in that direction, in putting Hong Kong firmly on the global biotech map. My sincere thanks to the HKEX for hosting this summit. I wish you all a rewarding day, the best of business in 2018 and a future flush with biotech breakthroughs. Here in Hong Kong, of course.